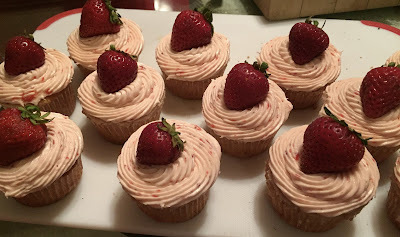 For years and years, I've looked for a go-to recipe for strawberry cupcakes. Many recipes contain strawberry gelatin as their main source of strawberry flavor, but I wanted something that uses FRESH strawberries. I'm not saying that the Jello cupcakes aren't good, and yes, I'll probably try them at some point, but I still wanted that fresh strawberry flavor that you just can't get in a box. So when my friend, Denise, asked me if I would bake strawberry cupcakes, I thought "ok, let's figure this out once and for all." I did some searching and found Sprinkles' recipe (which is the name of the first cupcake bakery, founded by Candace Nelson.) Actually, I googled to see if Martha Stewart had a good recipe and found that this is the recipe she uses. I figured if Sprinkles' recipe is good enough for Martha, then it's good enough for me. So I went with it. Turns out, they were a HUGE hit! I think "outstanding" was the word Denise used! They were really simple to make, and the icing that goes with it is absolutely amazing too. So I think it's safe to say this is now my go-to strawberry cupcake recipe. I can already tell I'll be getting many more requests for this one! You should definitely try 'em! Line a 12-cup muffin tin with cupcake liners; set aside. In a small bowl, mix together milk, vanilla, and strawberry puree; set aside. With the mixer on low, slowly add half the flour mixture; mix until just blended. Add the milk mixture; mix until just blended. Slowly add remaining flour mixture, scraping down sides of the bowl with a spatula, as necessary, until just blended. Divide batter evenly among prepared muffin cups. Transfer muffin tin to oven and bake until tops are just dry to the touch, 22 to 25 minutes. Transfer muffin tin to a wire rack and let cupcakes cool completely in tin before icing. I usually like to tweak a recipe here and there to suit my own tastes, but this recipe needs absolutely no tweaking at all. It's perfect just as it is. For deliciously moist cupcakes, be sure not to overbake them. I garnished each with a whole strawberry so there would be no question of what kind of cupcakes they are. Just sayin! They look awesome, don't they? I wonder how this recipe would work with other berries. Maybe blueberry? Raspberry? I'll definitely give them a try and let you know how they turn out! Yes, the strawberry frosting is fabulous, but you could also do cream cheese icing. That would be FABULOUS!